Bryan Ohio Real Estate - Wilson Auction & Realty Co. Ltd.
Wilson Auction and Realty Co., LTD. offers properties for sale in the Tri-State Area. (Ohio, Michigan & Indiana) The "Wilson" name has been synonymous with real estate sales and auctions in the Northwest Ohio area since 1969 and currently has several Brokers, Associates and Auctioneers to assist you in any way we can. When you are an informed buyer or seller, you'll make the best decisions for the most important purchase or sale in your lifetime. That's why our goal is to keep you informed on trends in the marketplace using the latest statistics in your local area. Real estate is a sound investment for now and for the future. As local area experts with knowledge of the communities, our objective is to work diligently to assist you in meeting your real estate goals. If you are considering buying or selling a home or would just like to have additional information about real estate in your area, please don't hesitate to call or e-mail us. Save Money And Avoid Costly Mistakes When Buying Or Selling Your Home. Receive our FREE guide detailing the basic of home buying and/or home selling. 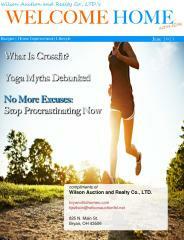 Free Complimentary Subscription to Welcome Home, an active ezine for homeowners. Articles and photos on home repair, remodeling, recipes, gardening, travel and more.